In order, for today's businesses and organizations to maintain, improve customer service and optimize resource utilization, their task and time management software must help to create an efficient, cost effective, web based customer focused support environment! Whatever your currently you do to track support requests on paper or spreadsheet or have help desk solution that is no longer adequate for your current needs, we invite you take a look at our TTM which enables you to provide a cost effective internet customer support and issue management environment. TTM is web-based issue management software that offers you the facility of tracking employee's assessment on daily basis i.e. 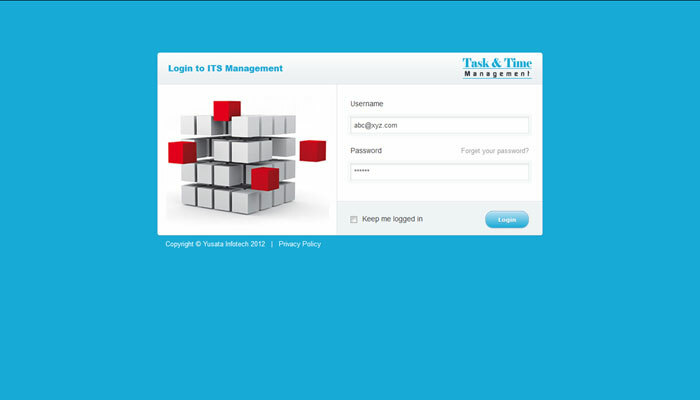 Employees can keep record of their Check-In, Check-Out time, along with tasks on daily basis. Administrator can supervise and manage employees, projects, customers and holiday records, tracking issues, managing issue assignment, keeping track of generated ticket from date of posting to meet with client needs and satisfaction, keeping track of company resources, assigned task, features of automatic email notifications, attachment handling. • Completely web based solution - only a web browser is needed to use system. • Easily accessible on your corporate intranet or website. • Easy login process for member where member need to provide required valid login name and password. • Feature for admin to login easily to manage all tickets in less efforts , check-In, check-out, and time sheet description on daily basis. 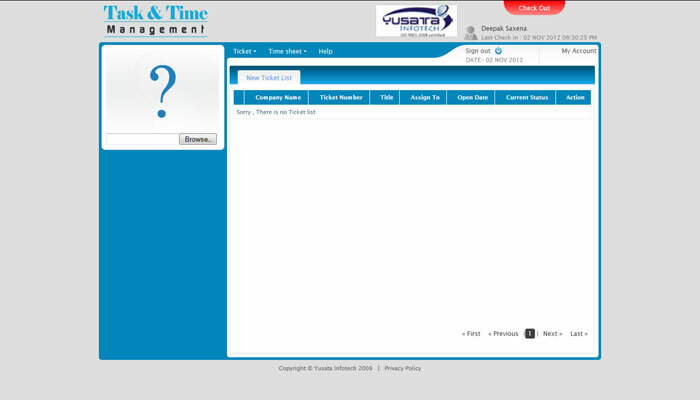 • Completely web based user friendly solution that provide functionality for submitting ticket in less efforts. • Having facility for setup ticket priority to low, medium and high. • Having feature of user profile management. • Feature to easily attach any required document related to ticket like any image file or document file while submitting the ticket. • Feature to closed any completed ticket at any time. • Complete dashboard that is quite easy to navigate to any required action in less number of clicks. • Role mapping for users to create new user profile to access portal. • Feature of user creation for user having rights to create new user for company. • Admin dashboard is centralized view for all current task and activity. • In admin dashboard you can view multiple companies and their users posted tickets and their updates. 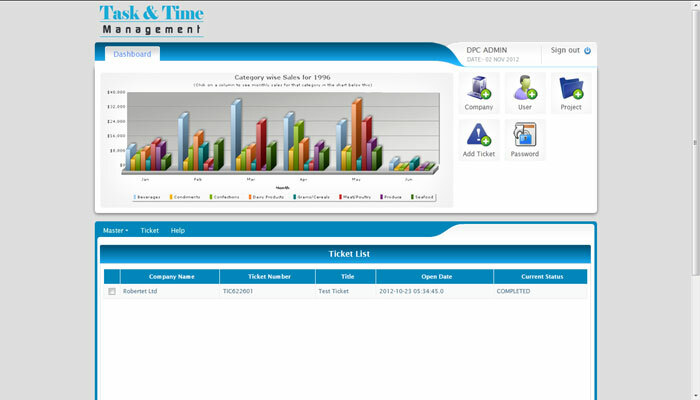 • Admin dashboard with the ticket listing and many key features that allows admin to perform operation on tickets. • Listing of all tickets with their current status and progress details with user and company detail. • Easy to perform action on ticket using action button on listing for less efforts working. • Check-In and Check-Out also done by admin to any resource. • Admin as well as Employee can track previous date's time sheet. • Admin portal provide functionality to assigned any open ticket to resource on the basis of their availability and ticket priority. • Functionality to view resource assigned task and their status. • Functionality to set estimate completion date of ticket. • All new ticket shown at resource task list. • Resource doing check-in in morning and check-out at wvening and fill time sheet according to there task or issue. • Resource alo have facility to see his time sheet of previous dates. Admin, member and resource can login using unique user id and password. 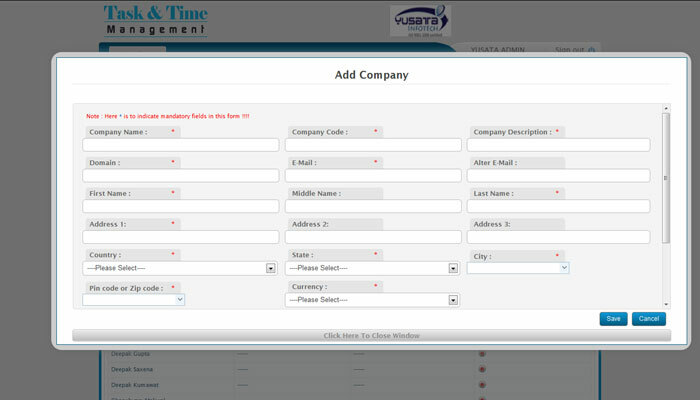 Admin can add company by filling details realted to new company. Admin can add users for the company, where login name, password and personal details related to user filled. 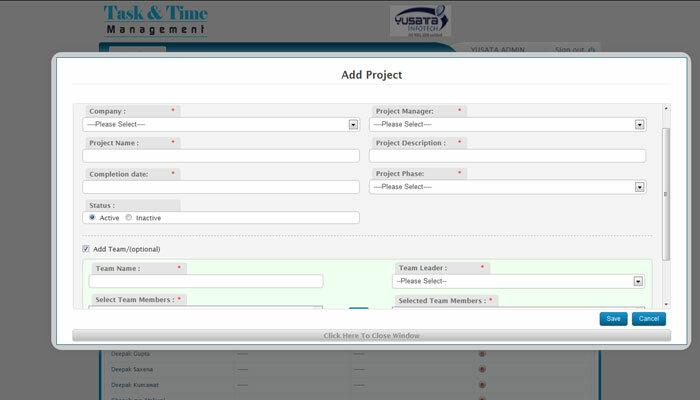 Admin can add projects with details such as project name, manager, team lead and member, description, project estimated time. Company resources attendence list managed here by check-in, check-out time and status. 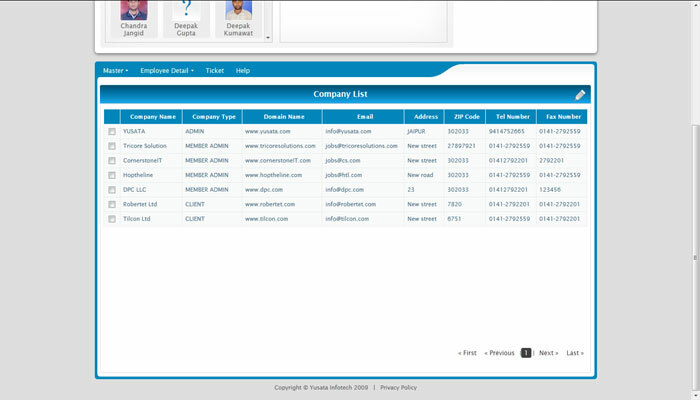 Admin can view all registered companies with complete detail in list view. Admin can view list of all team member with their respective projects and other details. Resource dashboard show ticket list and other details about the project and issues. Resource Calender used to show resource tiemsheets and attendence calendar to manage attendance. 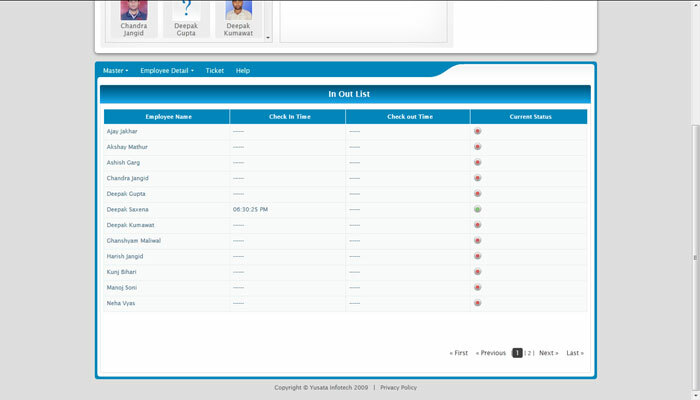 In Admin dashbaord, admin can view ticket list, attendence in chart form and can perform other functionalities such as add company, user, project, ticket etc.